This topic contains 16 replies, has 6 voices, and was last updated by angie 5 years, 10 months ago. Yes first one on since I joined the forum many years ago 😛 8 years!! It belongs to some friends of mine, and I’ve been to stay there many times. It’s high spec in excellent condition in a wonderful location, and I know there is some flexibility on the price. Not my style at all, more a traditionalist 😀 I think the pool area is an awful slab of concrete. Would be expensive to heat in winter. Location looks excellent. Love that sort of design but was it comfortable to live in? You lot have strange taste…looks like a Council building or health centre to me 😆 Doesn’t have the appearance of ever been lived in! Sorry Mark and your friends but I agree with Katy. I just see slabs of concrete. I like the older style cortijos. Those designs are interesting to look at, but they are all about clean lines, geometry, etc. Unless you are able to stick to the minimalist lifestyle the effect is soon lost when you actually live there, and it’s not as if you can readily paint the place a different colour or change the furniture if you get bored of it. No point in arguing about tastes thank God, but what do you want, socks on the washing line and stains on the carpet? It has hardly ever been lived in, which is one of it’s selling points. 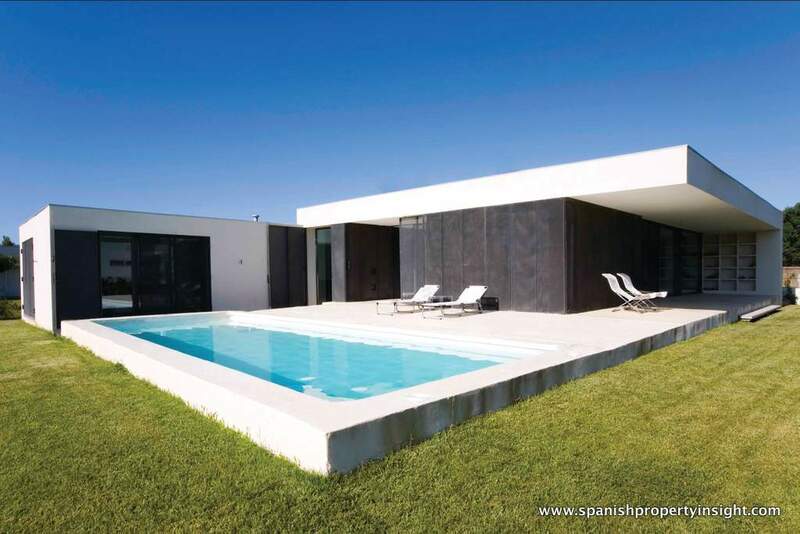 When you say a Spanish Cortijo style house, do you mean in Spain? We’ve harboured this idea of building or converting a property, possibly single storey, into a cortijo style property, but in the UK, it’s more the shape and style rather than totally Spanish which might look out of place. Do like the thin Spanish bricks for end pillars etc. We like the idea of buying either a rectangular boring bungalow, or one with an L shape, so it ends up with an ‘L’ shape both ends to create a central courtyard effect, and probably glazing in the courtyard with vaulted glass ceiling. We could grow citrus fruits and other Med. type plants inside, maybe a water feature too. Ground floor heating with air/ground source heat pump, and only 2-3 solar hot water panels which we already use in the UK which work well.